Who doesn’t struggle with the idea of wanting to add wall art to a room but balking at the price? Why not make your own! It’s so much easier than you think. These flowers can add a whimsical touch to a child’s bedroom or can be used to decorate a wall at a wedding or baby shower. 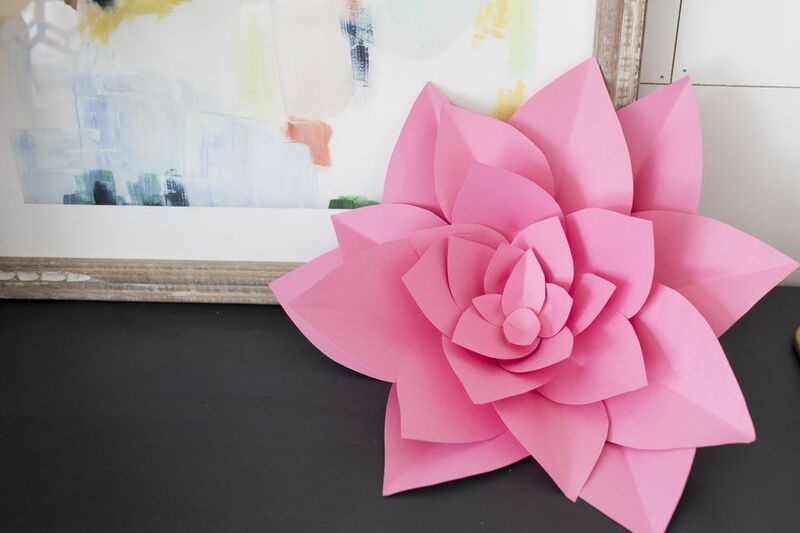 More resilient and affordable than the real thing, these paper versions can quickly become party staples. Perfect for a photo wall, they make a big impact while still being easy to make on your own. All it takes a little patience! You don’t need to make a million flowers either! This craft can get a little time consuming, so if you have a big project to do, it might be a smart idea to have some friends over and make a night of it. A few extra sets of hands will make it all go by so much faster! The most important supply here? You guessed it–the paper. Whatever you do, don’t skimp and get so-so quality paper. The success of this craft hinges on having flexible yet stiff enough sheets for these flowers. You’ll also want beautiful colors that complement each other too. Also, it’s worth noting that sharp scissors are a must. You don’t want the edges of the petals to look ragged. Luckily for us, flowers come in all shapes and sizes, which means you sort of have your pick when it comes to flowers to get inspired by. Roses and peonies are the perfect inspiration for this craft though, thanks to their petal structure. Obviously, each petal doesn’t have to look the same way it does in real life but use the shapes as a guide to help you draw the petals. Because you’ll need to make lots of petals, it might be a smart idea to come up with a few template petal shapes in small, medium, and large. That way if you do have help, people can work in assembly-line style fashion. Remember: You will have to customize the size and shape of petals as you start building your flowers. The first step is to create a bunch of petals in a few different sizes. Note: You don’t have to work with single petals if you don’t want to–you can instead create full flower shapes with three or five petals that will help make layering easier. The most important technique to make this project work is shaping the petals so they have some dimension. You’ll want to do this before you start gluing them together. There are a few ways to do this. You can fold each petal in half to create a vein and then shape the outside of the petals with the bone folder. You can also curl the tips of each petal, either in or out, to give them a nice shape. Cutting a slit in the bottom of each petal and then crossing the two pieces so the petal stands up is another great technique. 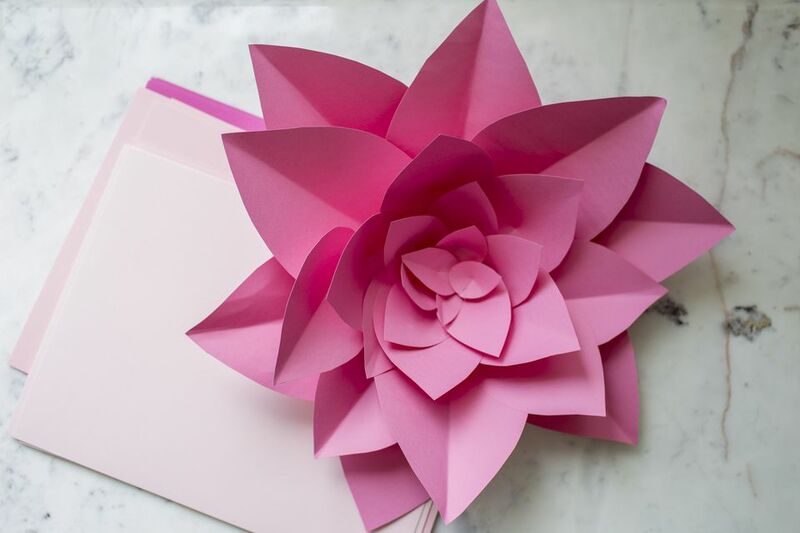 All of these ways of shaping the petals will ensure that your final product feels like the real thing instead of paper. Starting from the outside and working your way in, glue your petals together. We recommend using a small, round piece of cardboard as your flower base to glue petals onto. It makes it easier to hang later on because the cardboard is stiffer and holds up better to whatever tape or adhesive you’ll use to hang it than the paper would. You’ll want to place the petals so each layer is filling gaps left by the previous layer. Eventually, the petals will start to get smaller and you can form the smallest petals into a tighter bud–or you can take a strip of paper and roll it into a cone shape to form a tight, swirled bud. There’s beauty to working with hot glue on this project. It means that it dries quickly (almost instantly!) and that your flowers won’t fall apart in your hands. These flowers look best in groups, so once you have a bunch of them ready, you can hang them on your wall using a piece of sticky tack or Velcro Command strips on the wall. It depends on how long you’ll need them to hang.